Be the first to share your favorite memory, photo or story of Ada . This memorial page is dedicated for family, friends and future generations to celebrate the life of their loved one. 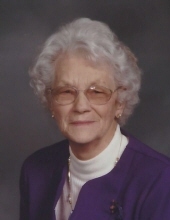 Ada Lofswold, age 98, of Sioux Falls, formerly of Madison, passed away Friday, March 22, 2019 at the Dow Rummel Village in Sioux Falls. Funeral service will be 1:30 PM on March 27th at Weiland Funeral Chapel with Rev. Constanze Hagmaier officiating. Visitation will be 5-7 PM on Tuesday at Weiland Funeral Chapel and will continue on Wednesday one hour prior to the service. Inurnment will be at a later date in Graceland Cemetery. Memorials can be directed to: Prairie Village, 45205 SD Hwy 34, Madison, SD 57042 Attention: Junius Schoolhouse. Ada Marcene Kluck was born on a farm near Hartford to August & Zelma (Brown) Kluck on August 24, 1920. She married Chester Lofswold in April 1946. They lived and worked in Sioux Falls until the late 50’s when they purchased machinery and livestock from Chester’s mother and rented a farm near Baltic. In the early 60’s they bought a farm near Madison. Like many farm wives Ada was constantly busy raising 4 children, growing a garden, prepping food for storage, assisting with the care of animals, helping with field work, sewing clothes and a multitude of other tasks. Despite those demands she always found time to play games with her children, assisted with homework and by her example instilled a sense of value, respect and integrity. In 1975, Ada became a library aide at Garfield school and worked there for thirteen years. She thoroughly enjoyed assisting children with the early Commodore computer, teaching library skills and keeping the library inventory up to date. During this time period she became interested in weaving and attended an adult education class at Dakota State. This skill led her to Prairie Village where she participated with two other women in establishing an annual event during the yearly threshing jamboree. They demonstrated weaving and spinning skills on the old looms situated in the Junius school building. Her interest in Prairie Village expanded to becoming a member of the Prairie Village auxiliary, serving as historian for the Village, assisting with multiple maintenance tasks and working with others to create an annual quilt for the Jamboree. She was honored in 2010 for 35 years of volunteer service and was always proud to help maintain the legacy of the early Prairie days. Ada particularly enjoyed teaching her granddaughters and daughter-in-law the skill of weaving. Her daughter-in-law Cheryl and her two daughters, Shannon and Erin are now carrying on Ada’s tradition of being involved with Prairie village. When Chester retired from farming Ada left her librarian job and over the next few years they enjoyed traveling. The two most memorable trips were driving the Alaskan highway without being run over by a logging truck. The second was a trip to Hawaii where Chester had been stationed in WW II. Ada was interested in genealogy and over many years researched family history. She managed to collect information about several generations of her family. Ada leaves behind a treasure of pictures, details and stories for her extended family to enjoy. She is survived by one sister, Nellvina Boyd of Grand Junction, CO; two daughters, Vonnie Anderberg of Lantana, FL, Darla Woods of Sioux Falls; two sons, Larry Lofswold of Midvale, ID and Curt (Cheryl) Lofswold of Sioux Falls; seven grandchildren, Shannon Lofswold (Dave Phelps) of Crooks, SD, Erin (Fred) Konechne of Humboldt, SD, Anne (Keith) Grantham Anderson of Arkansas, Andy Anderberg of Battle Creek, MI, Todd Anderberg of Ramona, SD, Sonya (Steve) Putlack of Boynton Beach, FL and 1st LT Ryan Lofswold of Camp Pendleton, CA; three great-grandchildren, Ashley Putlack, Brayden Scott and baby Adalee Konechne. Ada was preceded in death by her husband, Chester Lofswold; one brother, Loris Kluck and two sisters, Alpha Jarrett and Avis Mathison. The family extends gratitude and a thank you to the Dow Rummel staff for their compassionate care of Ada. To send flowers or a remembrance gift to the family of Ada Lofswold, please visit our Tribute Store. "Email Address" would like to share the life celebration of Ada Lofswold. Click on the "link" to go to share a favorite memory or leave a condolence message for the family.